Do you dream of having a family command center that helps keep home life organized and running smoothly? Or how about a place to sort and file those never-ending piles of paper that enter your home? School is right around the corner for most of us. In fact, I hear some are starting next week! Let’s start off the year right by creating a family command center. 2. Do you have unused space in the hallway? Turn it into a command center with just a few simple items. 3. Here’s another hallway one, with a few added elements. 4. I love this chalkboard command center and the excellent tips given for keeping it running smoothly. 5. This one from Pottery Barn is perfect because the table has a space to hold items like your purse, keys and mail. 6. Here’s a hidden command center, perfect for those of you lacking space or if you want it out of sight. 7. This one features a color coordinated sorting station, with one color given to each family member. 8. Real Simple gives you some tips on finding the right space and from keeping the area from becoming an unloading zone. 9. Clean and Scentsible shows us her command center set up in the kitchen. 11. Make your own magnetic board, which doubles as a dry-erase board. 13. Here’s one with a wall mounted kitchen hutch over a desk. 14. Purchase this set from Pottery Barn and you’ll be good to go. 15. I love these tips and ideas from the Container Store. 16. This one is set up on the kitchen counter and features a file system for sorting mail, plus a link to her Everything Binder. 17. Here’s a command center that utilizes an entire cabinet, plus space on the kitchen counter. If you have the space, this just might be for you. 18. 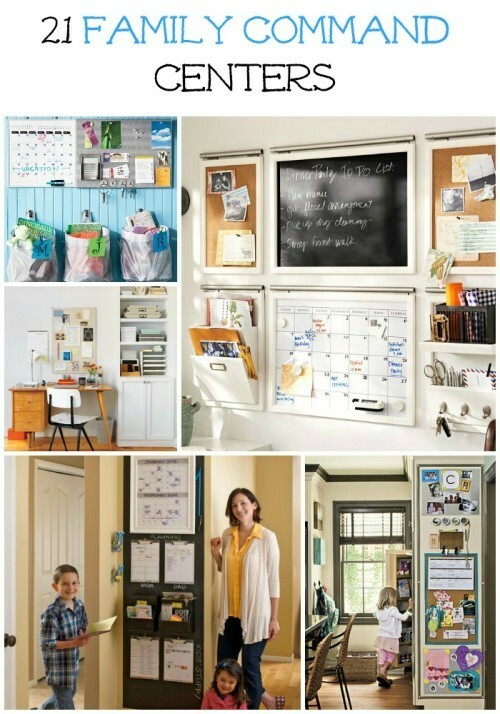 Check out this Ultimate Home Command Center with some serious organizing happening. 19. This one is super bright and cheery and features bins, hooks, metal board, oh my! 20. This mom created a command center from an unused cabinet surface for under $100. 21. With a bench from Craigslist, Pottery Barn goodness and determination, this beautiful command center was created. 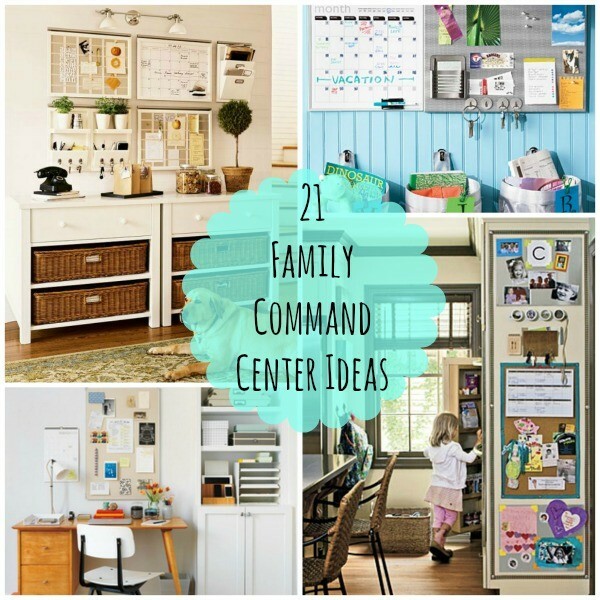 I hope you were inspired by these family command center ideas. I know I was! If your home office needs a revamp, have a look at my Small Home Office Ideas for some fantastic inspiration.